On the third Sunday of Lent, believers return their focus to the cross. The third Sunday of Great Lent is the Sunday of the Holy Cross, also known as the Sunday of the Veneration of the Cross. At this half-way point in the Lenten journey, believers are asked to look ahead to Holy Week and remember the way of the cross that Jesus followed. Last year, I happened to be in Jerusalem during Great Lent and I walked the way of the cross – or at least the way purported to be the way of the cross and marked for tourists. I walked through the courtyard where Jesus was condemned by Pilate, past the spot where Veronica handed Jesus a towel and created the “icon not made by hands,” the three places where he fell – all the way to Golgotha, which is today inside the giant Church of the Holy Sepulchre. In my mind, this journey took place over miles, through crowds of angry people. Being in Jerusalem, I realized that my vision of the event had been shaped by my own religious traditions and popular culture. The roads of the old city of Jerusalem are small and narrow. The courtyard where the crowd yelled “crucify him!” could barely have held a hundred people. The crowds of pilgrims I fought my way through on my journey were probably more dense than anything Jesus faced. Being in Jerusalem, I was brought face to face with Jesus on a human scale. This is also part of the purpose of Lent. According to Christian teaching, God had to come to earth in human form to understand human suffering, and during Lent, the small deprivations we require of ourselves are supposed to remind us of the suffering Jesus endured. But it’s hard to equate giving up some food items with any kind of real suffering, especially when avoiding meat and dairy and oil is a choice and not a necessity. But I suppose keeping the fast makes us more aware of what we are eating and why, and forces us to reflect on the broader teachings of Christ, which also encourage believers to care for those in need. 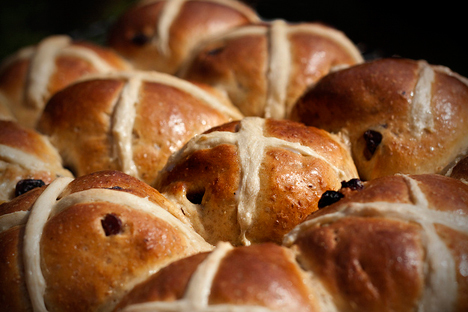 The way of the cross reminds me of hot cross buns, which a dear friend of mine makes every year during Lent. She told me once that while she knows they are supposed to be for Easter, every year her daughters pleaded with her to make them early, since they couldn’t wait. This recipe I took from the Vegetarian Society, since really, hot cross buns aren’t meant to be fast-friendly and I don’t like to use things like vegan margarine, but it looks passable. cup soymilk, warmed (may need a little more or less). In a large bowl, mix together the flour, spices, yeast, sugar, currants, mixed peel and lemon rind. Make a well in the center and add the melted margarine and some of the soymilk. Mix until a soft dough is formed, adding more soymilk if necessary. Knead the dough on a floured surface about 10 minutes. Place in an greased bowl, cover with plastic wrap and let rise until doubled in size (approximately 1-2 hours). To make the crosses, rub the margarine into the flour and add enough water to bind. Roll out the pastry quite thinly then cut into thin strips. Once the dough has doubled in size, beat it down and knead for 5 minutes. Divide into 12 pieces, roll each piece into a ball and leave on a greased baking tray. Leave to rise again for about 30 minutes. To make the glaze, heat the water and sugar in a pan until the sugar dissolves. When it cools, glaze each bun and top with pastry crosses. Bake at 350°F/ 180°C / for about 20 minutes or until golden.